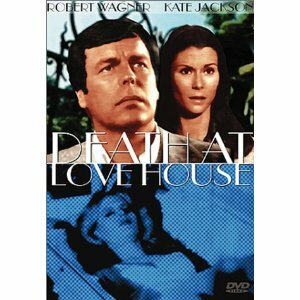 Death at Love House is a made for TV move from 1976 starring Robert Wagner, Kate Jackson and Sylvia Sidney in an Aaron Spelling production. Joel and Donna Gregory, husband and wife writing team move into the old mansion of dead Hollywood star Lorna Love so they can research and write a book about her and Joel's father who had a long affair together. Stormy nights on the old estate add atmosphere to the other mysterious things going on on this estate: an unknown women in white who wanders around the estate, the dead star's body enshrined in a glass tomb, a man in black cloak who is up to evil and Joel suddenly starting to lose his grip on reality as he immerses himself into the memories of the house. Donna has to get her husband to see that there is something wrong here and get them both out alive. This is one of those made for TV movies that's perfect to watch on a Saturday afternoon.